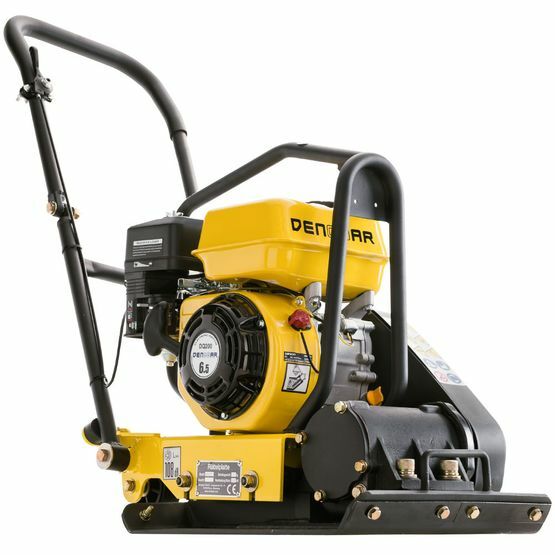 The plate compactor DQ-0213 is the lightweight within the DENQBAR models. 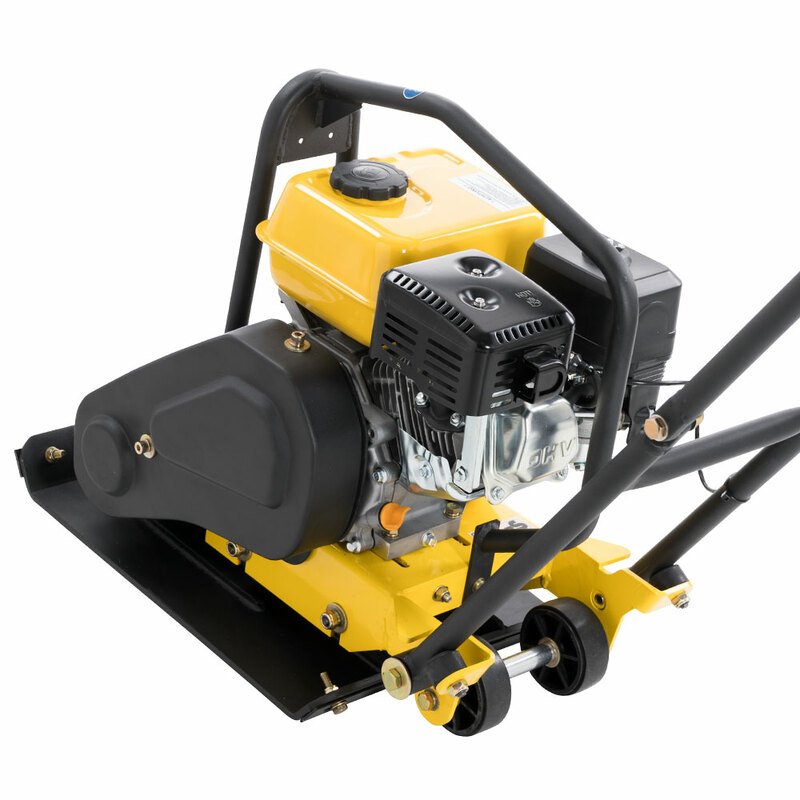 With its operating weight of 75 kg and its extremely compact design, the all-round plate compactor is one of the most popular on the market. 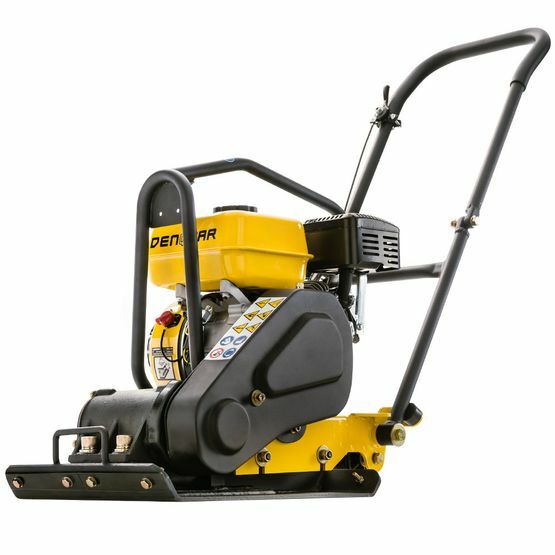 Its generated compaction pressure of 12 kN especially is convenient for compacting on small construction sites and confined areas. 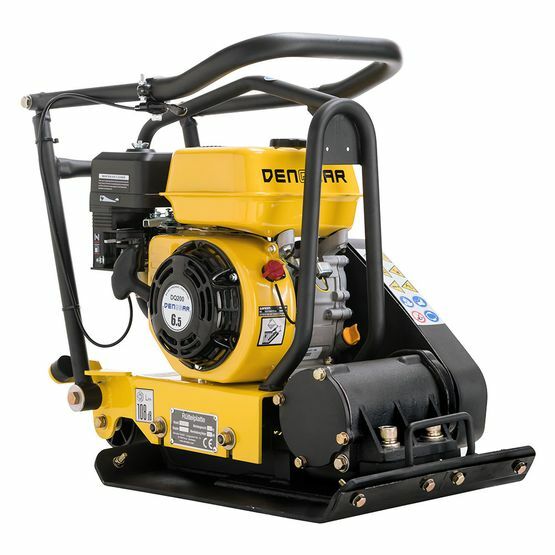 Datasheet of the DENQBAR DQ-0213 plate compactor to download. For an optimum compression, plate compactors need to be heavy. 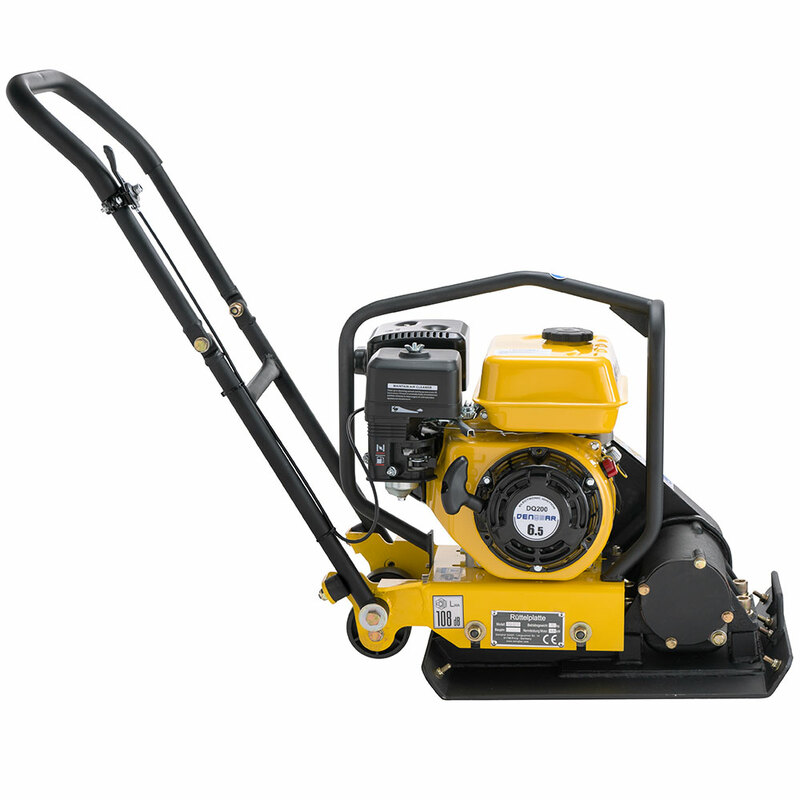 However, without a suitable wheel kit, moving the plate compactor can quickly become tedious. But DENQBAR won’t let you down! We have equipped the compactor with a built-in folding wheel kit so that your plate compactor is always ready to use. To install it, you just lift the machine with the handle grip and push the wheel kit under the machine in no time. That's it, your plate compactor is ready for transport! "Geprüfte Sicherheit" – Using this seal shows that we have voluntarily subjected our product to a stringent quality control by an independent licensed notified body. This certification has been awarded by TÜV Rheinland with the Certificate No S 50346570. Whether its paving a driveway, building a terrace or a smaller streets - all professionals as well as do-it-yourselfers need a plate compactor. Compaction is important to avoid subsidence. But how does it actually work? Centrifugal forces arise when masses are accelerated and moved quickly on a circular path. Due to these forces the plate compactor is able to move forward. At the same time, the downward directed forces have the intended consequence that the compaction pressure can enter the soil. Therefore, the particularly powerful cast steel exciter with a circulating unbalanced mass is of fundamental importance (see picture, number 1). When the unbalanced mass passes the uppermost point in the exciter, the upward directed centrifugal forces arise. As these centrifugal forces are much larger than the weight of the machine, the plate compactor jumps up a little bit with each rotation of the unbalanced mass for the fraction of a second. 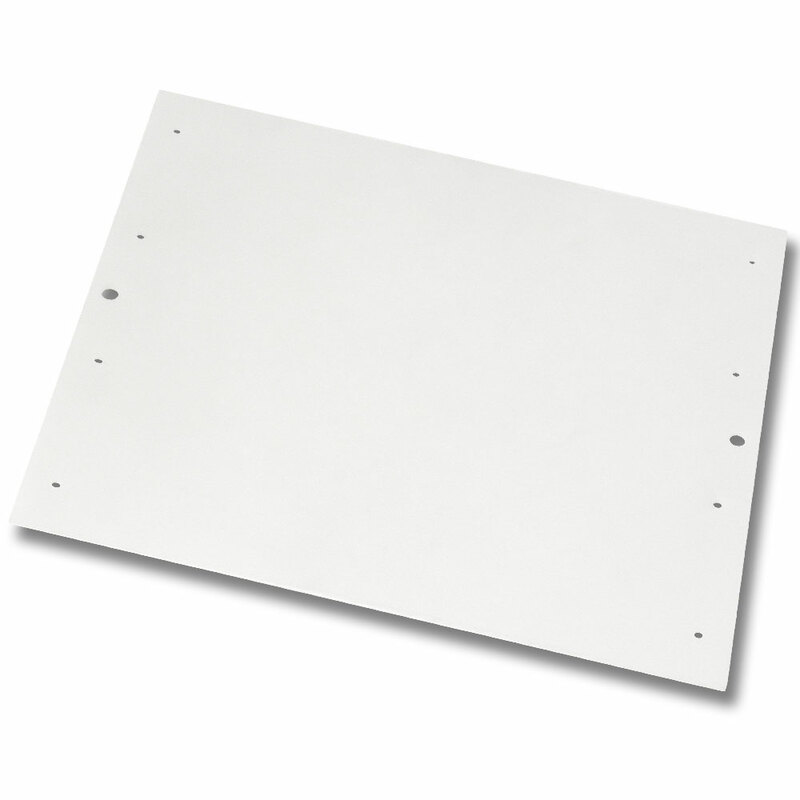 When falling back down, the area below the base plate will be compacted significantly due to the large force potentials (force is the product of mass and acceleration). Following, the same procedure starts again due to the continuous circular motion of the unbalanced mass. With its operating weight, the professional DENQBAR plate compactor has a sufficiently high mass to bring a gigantic compaction pressure of up to 35 cm into the soil via the extra strong cast steel exciter. This is aided by the advanced gasoline engine of the latest generation with its improved performance and environmental compatibility. Excellent quality at a favourable price! The forward running plate compactor is ideal for use in earthworks, paving and asphalt constructions and therefore is superseding bulky, larger plate compactors or rollers. Therefore, the DQ-0213 is equally suitable for do-it-yourselfers as for professional gardening and landscaping. The vibration-damped handle grip and the integrated folding wheel kit ensure a higher ease of use. The plate compactor convinces with a powerful, low-maintenance steel casting exciter and its simplicity of transport: Be flexible! DENQBAR – a first-class reference and a competent and customer-centred partner. Whether beginner or absolute professional - our wide product range offers the optimum solution for every application. Easy to handle, convincing operating characteristics, quickly ready for use and space-saving in storage: With these features, our entry-level model will also capture your heart!